We are so excited to make this announcement - A new partnership between Fruhauf Uniforms, Inc. and the Academy Drum and Bugle Corps has begun! The standing collar on the Fruhauf uniform is made from a mylar foundation with soft pellon on both sides. They are then protected with a bound fabric back vinyl at the top edge. Our shoulder pads are preformed having an additional support of coat canvas material sandwiched between the padding and then "needle punch" constructed so that shape and form retention is guaranteed. However, on a washable garment a foam shoulder pad is used. The Fruhauf lining is made of 100% polyester twill with a herringbone weave. This indestructable lining provides the greatest durability of any lining on the market today. A non-biased tape is placed on the bottom edge of the coat and the opening to add body, stability, and shape retention. 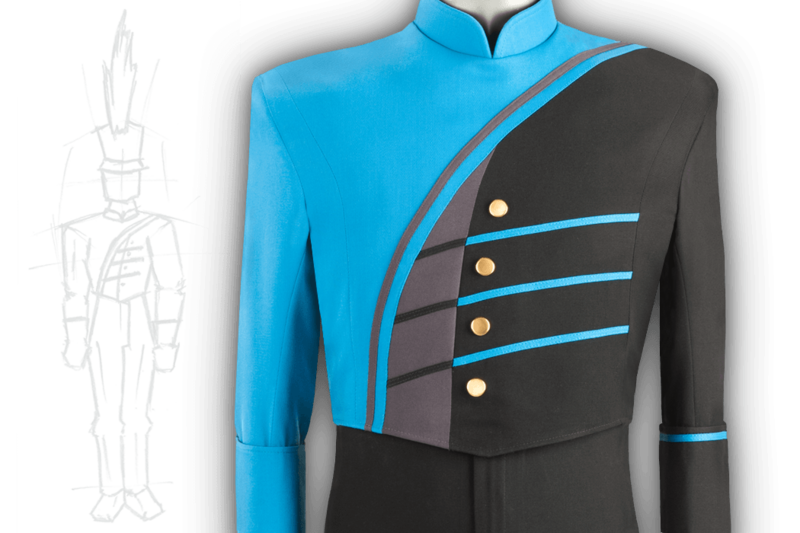 Our Go Gear® uniforms are made like no other band uniform in the industry today. Giving you the flexibility and manueverabilty needed when the lights are on you. We manufacture uniforms that are built to withstand unexpected conditions while at the same time maintain the comfort level expected from a high quality garment. Our hook and eye closure is attached to the collar frame with non-bias tape threaded though the hook and eye closure mechanism. This ensures flexibility, comfort and stability you would expect from Fruhauf Uniforms. Our shoulder pads are preformed having an additional support of coat canvas material sandwiched between the padding and then "needle punch" constructed so that shape and form retention is guaranteed. For proper chest support and contour while adding a smooth transition over the shoulder, Fruhauf uses a layer of hymo coat canvas supported by a layer of Nylo-Flex covered in felt. This provides a stronger foundation while using less material. 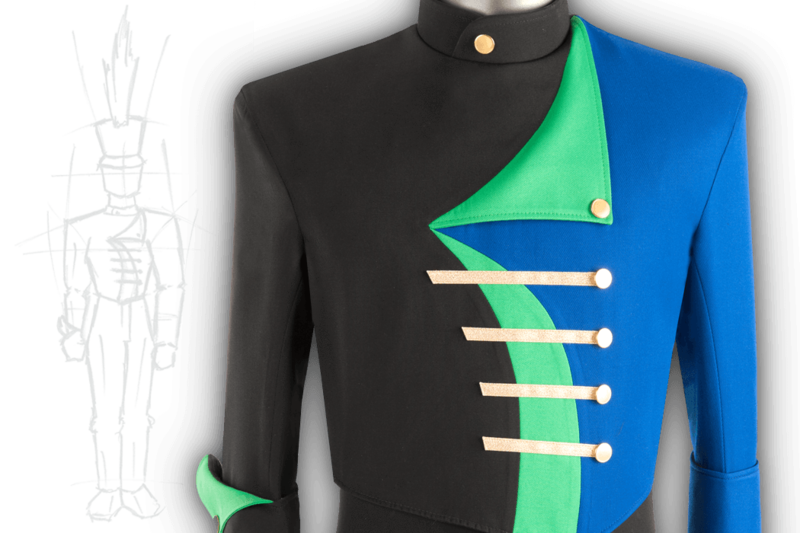 A Fruhauf fully constructed uniform is built like no other marching band uniform in the industry. From top to bottom, our solid coat foundation we keep you looking fresh and crisp for every performance. We manufacture uniforms that are built to withstand unexpected conditions while at the same time maintain the comfort level expected from a high quality garment. A band director’s time is a valuable commodity. One of our greatest pleasures is helping to simplify your schedule. It’s not always possible to make a factory consultation, so we bring the experience to you. Speak with one of our seasoned in-house designers about what best represents your school and band’s traditions, style and personality. This real-time, face-to-face meeting allows you to see and alter your design as it’s crafted and eliminates any guesswork, ensuring you get exactly what you want. Not only do you take full ownership of your uniform, you get to work in the comfort of your own office, saving you time and money. This cutting-edge, modern design is ahead of its time, assuring you’re not only fashionable today, but tomorrow as well. More ornamented than other styles, this eye-catching uniform is made to stretch with every ebb and flow, so you’ll never miss a beat. Modeled after military uniforms, this standard, classic uniform has endured the test of time. Our formal uniform simplifies concert wear to a single unit, so you never find yourself rummaging through the closet for a bow tie or cummerbund. Our wish is to continually meet the expectations of our valued customers. We want you to have confidence in our company and employees. At Fruhauf the customer comes first and we always aim to exceed your expectations.